What are the most common meniscus injuries? A torn meniscus is one of the most common knee injuries. The meniscus is an anatomical structure in the knee that takes a lot of punishment, so it is susceptible to both acute injuries as well as long-term degenerative conditions, such as osteoarthritis. In order to understand why doctors and physiotherapists treat this injury the way they do, it's helpful to learn a little more about what exactly the meniscus is, why it's important, and what makes it susceptible to injury. We will discuss this below, and then lead into our thoughts about bracing for a torn meniscus. In terms of human anatomy, the meniscus refers to thick cartilage inside of the knee joint. It sits directly between the femur (thigh bone) and the tibia (big shin bone) to help improve congruency and distribute forces. But why is this necessary? The knee joint is inherently unstable. The top of your tibia is essentially flat, whereas the bottom of the femur is rounded. This allows for motions like knee extension (straightening your leg) and knee flexion (bending your knee), but as you can imagine, these bones don't exactly fit together like puzzle pieces, as many other joints in the body do. You can picture the meniscus as sitting on top of the flat surface of the tibia, which actually called the tibial plateau. If you were to look down on top of the tibia from a bird's eye view, the meniscus would look like a Figure-8, and it's thicker on the outside than on the inside, thus forming a sort of socket. The helps deepen the joint, which creates a better fit for the rounded end of the femur. As you may be able to imagine, there is a tremendous amount of stress placed on the knee joint, even throughout routine daily activities. Not only does it carry the entire body weight above your knees, simple movements like standing up, walking, sitting down, running, lunging, etc, all place even more stress on the knee joint. It's actually incredible to think that healthy individuals can jump up and down without pain, and this is primarily because of the effectiveness of the meniscus. The shape of the meniscus that we described previously plays a large roll in distributing forces. Rather than the rounded head of the femur concentrating all the force into a small area on the top of the tibia, the fact that the meniscus squeezes in between the bones and provides a nice fit with the femur allows for the forces to be spread out more, thus reducing the stress on the tibia. So while the same force exists, it's not just in one little spot anymore. This explanation is a little more technical. More commonly, you may hear of the meniscus as being a "shock absorber", which some engineers may cringe at, as "distribution" is more accurate than "absorption". That said, there is some degree of true shock absorption given the nature of the meniscus material. The meniscus is more squishy than bone, so rather than having two bones clunk together, the bones will instead squish the meniscus, which can act to slow down how quickly the bones are coming together, so there is some absorption. A torn meniscus is probably the most common acute injury to that structure. This occurs when there is enough force in certain directions for the bone to actually cut or shred some of the meniscus off. This usually occurs when there is some sort of rotation involved, rather than pure compression or side bending. That said, rarely do injuries involve a pure movement in only one plane, so it's usually a little messier than this and likely requires a thorough physical assessment by a doctor or physiotherapists to pinpoint the problem. 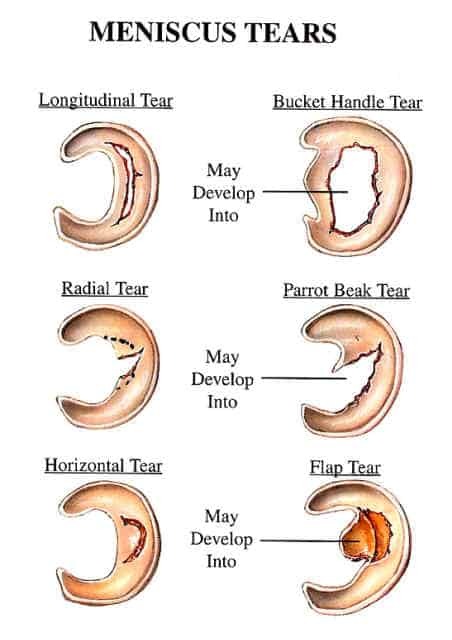 Furthermore, there are many different types of meniscus tears. These can range from minor damage to meniscus, where you can almost think of this as a form of "scraping", to something more pronounced like a significant tear that results in a flap of meniscus being exposed, where you can think of this one more as a "cutting and peeling" type of tear. This is usually a little tricky, which is why you should always have a healthcare professional take a look, ideally someone with a strong orthopedic background. Some people feel a pop when they injure their meniscus, but this can be a sign of other injuries as well. Lots of times, people can still walk, and some athletes will try to play through the injury, but over the course of the next few days it becomes more painful and stiff, and will ultimately end up getting worse. One obvious symptom some people may experience is a full locking of the knee. This happens with a bucket-handle tear or something similar, which is that flap that I mentioned previously. The flap gets folded up and gets in the way of your knee movement, but from the inside of your joint. I had this happen to me personally when I last tore my meniscus. I injured my knee playing hockey, and aside from being painful, it just felt really weird. When I woke up the next morning, I got out of bed and actually fell down because my knee was completely locked and I did not expect it. It was an extremely weird feeling. I had all my sensation, the pain was manageable, yet I simply couldn't bend or straighten my knee. After a visit to the physiotherapist, followed by some treatment, I was able to get back on the ice fairly quickly (I forget exactly how long it took in my case). 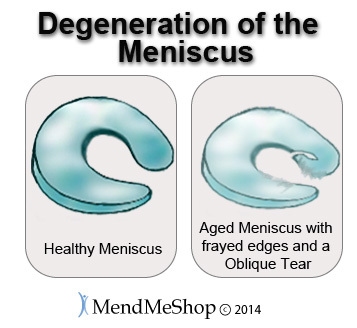 The meniscus is also prone to degenerative changes, which basically means it wears down over time. As we age and our menisci become more worn down, they also become more susceptible to tears. Therefore, older individuals need to be extra careful with this. If a tear doesn't occur, great! But there are still some things worth monitoring with age. Even if no acute tear ever occurs, continued degradation of the meniscus can facilitate the development of osteoarthritis, which can end up being just as (if not more) debilitating. Fortunately, there are many way we can help prevent osteoarthritis from developing, and the first line of treatment once it is diagnosed generally involves things you can do on your own at home, such as altering your diet and activity levels. Just like any other injury, treatment for a torn meniscus will directly depend on the nature of the injury and the individual themselves (e.g. young, old, active, sedentary, pre-existing conditions, etc). That said, there is some general information that typically holds true in many situations, and we'll describe some of this information below. Rest may be necessary in the first day or two while there is inflammation, but contrary to popular belief, it's typically best to get moving as soon as possible. HOWEVER, timing of progression requires careful planning and professional input, so please keep that in mind. Ice is extremely helpful in reducing swelling, and can also help with pain via numbing of the area. That said, make you have a barrier between your skin and the ice. Something like a thin cloth or a dish towel usually works pretty well. Typically, the ice should be placed on the front of the knee just below the patella, as well as the sides of the knee. It can also help to reduce inflammation, which is a natural healing process, but if it goes on for a long time it can potentially exacerbate symptoms. Compression is also helpful to reduce swelling, just don't apply so much pressure that you cause more damage or cut off circulation. A reliable sign of causing more damage is noticing an increase in pain, or no reduction in pain over time. Elevation is also helpful for swelling, as it assists with venous return (pumping blood from the legs back to the heart), which in turn helps clean up the area a bit faster. It also prevent accumulation of stagnant fluid in the lower limbs, which is also a contributor to swelling. This may sound like the same old, but it's actually crucial that you seek out professional help for any injury. Our bodies are extremely complex, and having a bit of help can go a long way in helping you feel better as soon as possible. In the case of musculoskeletal and orthopedic injuries, a physiotherapist will have a much more thorough expertise, especially as it relates to rehabilitating an injury. However, depending on the state you live in, as well as your insurance coverage, you may have to see the doctor first in order to receive a referral for physiotherapy. Physiotherapists are usually really good at providing the help in the early stages when you need it, and as you heal, they gradually taper off their involvement, ultimately providing you with the education to properly continue with your recovery (and potentially further injury prevention methods) at home. Knee bracing can sometimes help for a torn meniscus in certain cases, but a purely isolated torn meniscus often times doesn't require external support. That said, meniscus injuries usually don't occur in isolation, but instead, along with other injuries. The ACL and MCL are examples of ligaments that are commonly injured along with the meniscus, and these definitely benefit from external support, especially in the early stages of recovery or when participating in an activity that may increase risk of re-injury. Therefore, we will review three different braces for a torn meniscus, and will describe some general situations when they may be used. At the end of the day, your physiotherapist will be able to provide you with further direction, as choosing the best brace for a meniscus tear will depend on your specific injury, but here is some general info to help get you started. The Shock Doctor 875 Knee Brace is one of the most versatile knee braces out there. The reason is because of its all-around ability to provide support without being too robust. It's actually fairly slim for the amount of support it provides, and it's known to be fairly comfortable. If you have an isolated meniscus injury, this likely won't do too much to help you out. If there is a bit of additional damage to the surrounding ligaments, then this can be a great way to help minimize the risk of aggravating the injury as you progress through your recovery. When looking for the amount of support a brace provides, one of the main things is how rigid it is and if there are any hinges. In this case, it does come with bilateral hinge supports that run down the sides of the brace, and these basically mimic the ligaments on the side of your knee, adding to the support they provide. Therefore, this could help with a lot of different knee injuries, including meniscus injuries, but its benefits will be maximized if there are other structures damaged around the knee that compromise stability. The Ultra Flex Athletics Knee Compression Sleeve is a simple and affordable method of treating problems. Once again, it won't do too much to help physically heal an acutely torn meniscus in isolation, but it can help with managing symptoms and speeding up some of the recovery process, as well as help with degenerative changes to the knee joint. There isn't anything overly fancy about this compression sleeve, but sometimes keeping it simple is best. If you read our little section on the R.I.C.E. protocol, you may have already guessed that this sleeve can be a great way to help provide compression to the area when there is swelling present. Additionally, some people find that compression sleeves help manage pain with conditions like osteoarthritis, which can be brought on by injuries like a torn meniscus. In summary, this sleeve provides minimal support, so if you have compromised ligaments in or around the knee joint that require some external support to help take over their role, then you may want to look for something a little more robust like the Shock Doctor Brace or something else with rigid support hinges. If you're suffering from osteoarthritis pain with activity, or you're dealing with swelling in the knee, then this could be a legitimate option worth considering. The Tech Ware Pro Knee Brace pretty much falls between the two braces above in terms of support. It provides a little more than a compression sleeve, but not as much as the Shock Doctor 875. This one is often used in the later stages of injury recovery when you just want to prevent some minor tweaks or just add a little extra support for confidence, but it doesn't have rigid hinges to really stop the joint from going into positions it shouldn't. This brace is fairly comfortable and offer good bang for your buck. It provides compression and support via a snug fit and a strong strapping system. Therefore, you get a little bit of both worlds - compression and support, but not tons of either. In the case pf meniscus injuries, this brace can be useful when you need a bit of compression, or you want a little bit of added support to make sure you're keeping your knee in a good position, and it help you be more aware of your knee positioning when you're moving around. It will be much more valuable if there is other damage to the knee as well, but in any case, this brace is quite versatile. While the treatment of a torn meniscus will depend on the exact mechanism of injury and the extent to which the meniscus is damaged, we hope that the information in this article has provided you with enough direction to get a start on your recovery. Therefore, this also means that bracing may be a good option in some cases, while other cases may not benefit as much from a knee brace. That said, peace of mind also counts for something, so if you would rather be safe than sorry, that's a legitimate consideration. If you would like more information on whether or not a knee brace is appropriate for your particular injury, we would suggest speaking with your family physician, but if you are able to visit a physiotherapist, they may actually be able to provide you with more detailed information.